Traumatic Brain Injury Lawyer | Simmons & Fletcher, P.C. Nothing is more important than your brain function. At Simmons and Fletcher, P.C., we have seen how devastating a traumatic brain injury can be. You could be looking at life-long medical expenses and long-term care needs for your injured loved one. It is important that you hire a traumatic brain injury attorney who is experienced at helping clients get to the right medical experts to determine the exact extent of brain function loss and prepare a future life-care plan. Our brain injury lawyers have helped many clients who sustained brain injuries in accidents ranging from falls from loading docks to simple auto accidents. Let us put our experience to work for you. What is a Traumatic Brian Injury (TBI)? Traumatic Brain injury is an injury to the brain caused by blunt force. A TBI may be sustained in a number of ways and may vary in degree from minor to catastrophic. The injury itself may be the result of direct impact or trauma to the head, indirect trauma to the brain from impact with the skull or from deprivation of oxygen to the brain sue to medical malpractice. If you have suffered a brain injury as a result of someone else’s negligence, call now for a free consultation with a traumatic brain injury lawyer to learn your rights: 800-298-0111. According to the Center for Disease Control, approximately 1.7 million people suffer traumatic brain injuries annually. Over 70% of all traumatic brain injuries are Mild Traumatic Brain Injury. Traumatic brain injury results from a blow to the head that may vary from a seemingly minor bump to a penetrating head injury that disrupts the normal brain function or even a brain stem injury. Brain injuries may result from mild concussions to severe permanent life-long injuries. Our traumatic brain injury lawyers know how devastating a TBI can be to you and your family, and we have been fighting for people just like you for over four decades. The effects of brain injuries are not always immediately apparent. They can develop slowly over time following a head injury. As we have seen in recent years, many soldiers returning from combat overseas are discovering the latent effects of traumatic brain injury suffered from shell shock. Sports athletes, particularly boxers and football players, may show signs of traumatic brain injury later in their careers as a result of repeated mini-traumas occurring over their career. Traumatic brain injury can cause serious and severe long-term issues, including memory loss, inability to perform reasoning tasks, difficulties in speech and communication, altered or decreased sensation, and emotional problems. It can also cause epilepsy and increase the risk for conditions such as Alzheimer’s disease, Cerebral Palsy, Parkinson’s disease, Wernicke-Korsokoff Syndrome, and other brain disorders. Automobile accident victims can sustain concussions and even traumatic brain injury as a result of the whiplash effect on their heads and necks. The human brain is effectively floating inside the skull. When the head gets whipped back and forth in a motor vehicle accident, often the brain gets slammed into the insides of the skull resulting in the bursting of tiny blood vessels (hemorrhage). Falls involving striking the head. Injuries during childbirth. Doctors attempting to force natural child births when the baby is too large for the canal can result in improper use of the forceps and/or vacuum systems resulting in skull compression and/or oxygen deprivation. Failure to monitor patients following surgery. When patients are sedated and their breathing slows or stops due to failure to monitor. If your loved one has suffered from either of the above circumstances, you should speak to a Texas traumatic brain injury lawyer today. Cognitive deficit testing is often necessary to evaluate and understand the long-term effects of traumatic brain injury. This involves a series of tests that study the motor skills, thinking, reasoning, recall and discernment abilities of the brain. This type of testing can be very expensive if not covered by health insurance. At Simmons and Fletcher, P.C., we can help you get to the right kind of medical, psychiatric and psychological experts to evaluate and treat your injury. 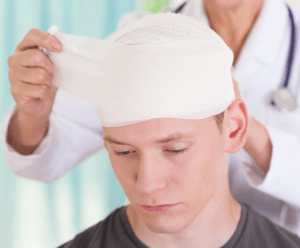 If you have or a loved one has suffered a head injury or concussion due to someone else’s negligence, call us for a free consultation about your case. We understand that brain injuries can be catastrophic. We have helped numerous families and victims since the 1970’s and we would be honored if you give us the opportunity to represent you. Speak to a traumatic brain injury lawyer in Houston today! The initial consultation is always free and you don’t pay a dime unless we make a recovery on your behalf. Call us now at: 1-800-298-0111.